A full meeting of Cambridgeshire Police Authority held on the 20th of December 2011 began debating proposals from Chief Constable Simon Parr to expand the force’s TASER use. I hope when the force’s proposed changes to TASER policy are reached during today’s meting clarity will be obtained on what is proposed. I hope members are able to ensure it is made clear, in public, if there a proposal to extend deployment of TASER beyond the Tactical Firearms Unit, or not. The papers refer to training more officers to use TASER; it isn’t made clear if this is expected to lead to more officers being routinely deployed with TASER. If the proposal is to ensure all firearms trained officers are also TASER trained I would be surprised that wasn’t already the case and strongly support it. I think a TASER ought always be available as a less lethal option than a gun. I urge the authority to follow the lead of the Metropolitan Police Authority and consider the potential impact on police-public relations of a wider roll out of TASER. I think that routine arming of front-line officers with TASERs is clearly a strategic decision, one for the authority, and not an operational matter for the chief constable. I think it’s important that the decision on if it is a decision for the authority or not is made in public by the authority, and not as it was last time, between the chair and the chief constable in secret. The relevant agenda item was not a full report on the proposals which were merely mentioned briefly in the update from the Scrutiny Committee. The authority were told that the full proposals would be presented, in writing, to the authority’s Finance and Resources Committee on the 18th of January 2012. Police Authority member Cllr Wilkins, (Liberal Democrat, West Chesterton) led the questioning. He noted the force’s plans mentioned training, and asked what the consequences of new policy would be in terms of police officers on the streets with TASER weapons. Chief Constable Parr ignored the question and answered a different one. He replied that he was not anticipating any change in the types of circumstances in which TASER was used. Cllr Wilkins asked if the Chief Constable was proposing to extend deployment of TASER beyond the Tactical Firearms Unit, or not. The Chief Constable said: “Yes”, and added that he did “not expect to see TASER being used more often as a result”. The Chief Constable was asked to confirm his proposals were for officers in non-firearms roles to carry TASER weapons. The Chief Constable said: “Yes, but not in huge numbers”. The authority asked the Chief Constable to ensure that the numbers were included in the report on his proposals to the Finance and Resources Committee. Cllr Wilkins said he did not welcome the proposal to arm non-firearms officers with TASERs. He said that many of those he represents have concerns. The Chief Constable explained his thinking. He said that currently firearms teams get sent to incidents where they know they’re not going to be called upon to use conventional firearms and they’re called just because a TASER is needed. The Chief Constable said it was more practical, and safer, in those cases to “just send TASER”. The Chief Constable told the authority he would rather be TASERed than hit with a Baton, on the grounds that the effect of the TASER would wear off more quickly. Cllr Wilkins asked if the extra officers would always be carrying TASERs or if they would carry them out only on specific occasions. The Chief Constable said that the force was considering how authorisation to deploy TASER should work, he said there had not been a decision yet on if it would be down to the individual officer to decide if to carry a TASER or if they would only be carried when specific authorisation to do so had been given. The Chief Constable said he was not rushing into this. Cllr Wilkins again expressed his reservations, saying he was very nervous about the Chief Constable’s proposals. Cllr Wilkins expressed concern about members of the public seeing police officers walking down Regent Street in Cambridge on a Friday night armed with TASERS. The Chief Constable said the TASERs were very discrete and members of the public would not be aware of them, he offered to bring one, to show how it would be carried, to the Finance and Resources Committee. (It wasn’t clear how concealed the Chief Constable is proposing the weapons to be, but elsewhere in the country where they are carried they are highly visible). Cllr Wilkins indicated that he wasn’t very impressed with the Chief Constable’s argument that people wouldn’t be aware the officers were armed with TASERs. Cllr Matthew Lee (Conservative, Peterborough City Council) asked the Chief Constable if he would seek the authority’s approval for his new TASER policy. I don’t think I need your approval. Would I go against if every member of the authority said no? Yes I would. He added that he would though like to “understand the authority’s concerns”. Cllr Lucas spoke to urge debate to wait until the full details of the force’s proposals were available in writing, in the papers for the 18th January 2012 Finance and Resources meeting. 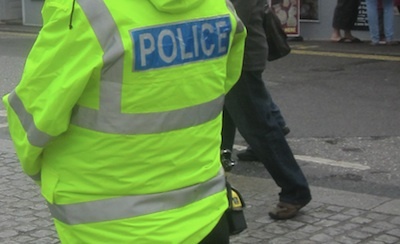 Cllr Nazim Khan spoke to relate how he had been present with police in Peterborough when they had been called to an incident involving a knife. He said he didn’t want to take a position on TASERs but thought the police ought be protected. The Chief Constable explained that Bedfordshire and Hertfordshire (the two forces Cambridgeshire works closely with) already armed non-firearms officers with TASER. He said that the reason TASER was issued to non-firearms officers in Hertfordshire was that it had become an “operational necessity” after the stabbing of an officer in a freak incident at 0630 on a Monday morning. The Deputy Chief Constable John Feavyour asked authority members to write to him directly with items they would like covered in the report to the Finance and Resources Committee on the 19th of January 2012. Two of the authority’s unelected members, Ruth Joyce and Nic Williams left prior to the TASER discussion, Cllr Shona Johnstone left during the item. Public perception of the police; and the potential effect of creating further separation between the police and public. Evidence from other parts of the UK where non-firearms officers have been armed with TASERs. Recent large rises in UK Police TASER use. What additional relevant training and experience (eg. in relation to conflict resolution and use of force) members of the Tactical Firearms Unit have, which other officers carrying TASER would not. Returning the decision to a meeting of the full authority, rather than letting it be debated and determined in a relatively obscure sub-committee. I think it’s very worrying that we’ve got a Chief Constable who sees the police authority as a body merely to debate with rather than the body which is responsible for taking strategic decisions in relation to policing Cambridgeshire. I suspect by making clear he would overrule the police authority if they seek to block his TASER roll-out to non-firearms officers the Chief Constable will have ensured they do not do so. Home Affairs Select Committee Session on TASERs – December 2010. My article reporting Chief Constable Simon Parr to expand the force’s TASER use – December 2011. In response to a report from the Scrutiny Committee of 13th December 2011, the Cambridgeshire Police Authority has called for a full report on Taser, to be considered in public at the Finance and Resources Committee on 18th January 2012. Speaking in Parliament (at the 9th Delegated Legislation Committee) on Monday the 23rd of January 2012 Cambridge MP Julian Huppert said he thought the chief constable was wrong to say he didn’t need the police authority’s approval to change the force policy on TASER. Direct link to video of Huppert’ speech.